Sukuma Sakhe, "Let us stand up and build", is Premier Zweli Mkhize's flagship programme that focuses on encouraging all sectors of society to change their own lives, rather than only relying on government to deliver. In 2009 the provincial government started a programme of integrating all departments to focus on solving community problems from the ground. The campaign is aimed at promoting human values, fighting crime, diseases and social ills to ensure moral regeneration. As part of this programme, all government departments work together visiting the poorest, most deprived households in our province to bring health, welfare and other services to them. 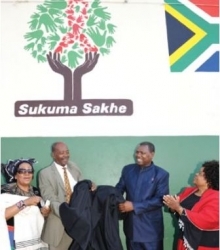 Operation Sukuma Sakhe encompasses: the "One Home One Garden programme"; ensures that families get assisted to register for birth certificates and Identity Documents; promotes education, skills development and youth development and emphasizes the delivery of services and infrastructure development. The development and roll-out of Operation Sukuma Sakhe is being driven byMs Busi Kuzwayo, who has recently returned to South Africa after a two year stint as Consul General to India. Ms Kuzwayo is very excited about this initiative. "I love the model. It is very clever as it enables individuals to change their lives, whilst improving communities". The entire programme of government needs partnership with the community to work together to rebuild the fabric of our society and rebuild our nation. This builds on the Premier's commitment to build partnerships between government, business and civil society. Working together with the integrated services of government departments, job creation through building access roads, community facilities and human settlements will be the base on which the social mobilisation will be anchored. Traditional communities are owners of 3.3 million ha of land. To give effect to the programme the KZN Department of Co-operative Governance and Traditional Affairs will be facilitating the granting of leases for the building of schools, cr�ches, health facilities, commercial and other developments. In another initiative the KwaZulu-Natal Department of Arts and Culture has deployed senior managers to build partnerships with the community in order to make a purposeful contribution in the ten district municipalities andmetro with reliable, appropriate arts and culture services. The KwaZulu-Natal Government will also try to bring food security to its people through the 'One Home One Garden" campaign where seeds are provided to households by the KZN Department of Agriculture, Environmental Affairs and Rural Development and private institutions. The campaign is aimed at promoting a culture of producing vegetables for household consumption and enhances food security at a household level. The programme has been rolled out to schools and churches across the province. Over 800 000 households have benefited through various interventions, including distribution of seeds, hand hoes and other implements as well as the establishment of community gardens and tunnels. The Department of Agriculture, Environmental Affairs and Rural Development has also initiated a basic training programme on vegetable production in partnership with the Independent Development Trust (IDT). In 2010/2011 15000 beneficiaries were trained on vegetable production throughout the province. This financial year (2011/2012) training will be accelerated to ensure that beneficiaries obtain maximum benefit from the seed they get from government. In response to this programme the Department of Co-Operative Governance and Traditional Affairs is going to support municipalities in ensuring the establishment of at least one market per municipality. These markets are intended to support and encourage local producers and therefore to promote food security, as well as export potential for fresh produce. The Department of Public Works has broadened this programme to include the establishment of food gardens at government buildings. The Office of the Premier jointly with the Department of Public Works, Department of Agriculture, Environmental Affairs and Rural Development and the Department of Human Settlements and together with the Wildlands Conservation Trust has launched the KZN Greening Initiative. This project will support the planting of 500 000 fruit trees, 500 000 indigenous trees and the collection of over 75 000 tons of recycling, across KwaZulu-Natal, over the next five years. In the process, 800 new permanent jobs will be created and 25 000 community members will receive livelihood support and skills training. A set-aside budget of R9, 5 million will come from the partnering departments. The Wildlands Conservation Trust has secured additional support from the African Conservation Trust, National Lotteries Distribution Trust Fund, Bonitas Medical Fund, Unilever SA and Time Freight. "Our Wildlands Initiatives aim to support the transformation of South Africa's communities, nurturing green entrepreneurship, cleaning, greening and saturating our partner communities with water tanks, bicycles and solar power heaters, and restoring the ecosystems that underwrite their livelihood, their rivers, wetlands, forests and grasslands," says Dr Andrew Venter, Wildlands CEO. The Premier has been inspired by the change in the attitude of the Willowfontein community members who are "standing up" and "building" their own lives. Willowfontein, in Pietermaritzburg, is now clean because the "gogos" are fighting for the dirt. Thousands of green-preneurs - tree-preneurs, waste-preneurs and food-preneurs are growing trees and food and collecting recycling. They barter these for food, clothes, building material, water tanks, bicycles and any form of educational support to improve their lives. The KZN Department of Education has established partnerships with business, commerce and industry towards development and programme implementation in education centres. The Embassy of the Kingdom of the Netherlands (EKN) has provided funding for the development of the Education Centre programme. As a consequence the Ndwedwe, Phongola, Vulindlela, Bangizwe, Jolivet and Emawusheni Education Centres have been constructed and are to be furnished and equipped using EKN funds. Amongst other companies in the private sector ALTEC/UEC supported the construction of a Media Centre and IT Centre at the KwaMashu Education Centre. All the rooms are fully furnished and the computer lab was equipped with 50 computers. ALTECH/UEC is also funding PROTEC to operate from the centre and runs Saturday and holiday Maths and Science Programme for learners and teachers in KwaMashu. Funding was provided by the cement manufacturing company, NPC Cimpor, to renovate and furnish Amajuba Education Centre to have 12 rooms to be used as offices and meeting venues, four lecture rooms, an internet caf�, a toy room, a library, and will have 22 dormitories which can accommodate up to 66 teachers. Other facilities include a dining room and a kitchen. In line with the strategic objective of accelerating rural housing development throughout the province, the KZN Department of Human Settlements continues in its efforts to invest resources in themost indigent of rural communities. Through the Operation Sukuma Sakhe programme 93 houses were been built in 2010/2011. The integrated work across provincial departments on this programme has resulted in numerous submissions requesting the urgent provision of shelter for the poorest and most vulnerable in our Province. Funds have been set aside for this programme in the 2011/2012 year. Through Operation Sukuma Sakhe there is an understanding that we are building a better life for all our people. This is extremely important because the continued growth of the province will be based on the extent to which government creates synergies. Building bridges and creating a unified front consisting of government, business and civil society will help this province prosper.